To fully protect your home, yard, and landscaping, an efficient gutter system must keep water flowing off your roof and away from your home. Without gutters, water will simply spill off the roof edge, staining your siding, wearing away your foundation, and eroding plants and landscaping. If your home is without a properly installed gutter system, eventually, your basement will leak and crack due to the pressure of the water on the sides of your foundation. Energy View installs efficient gutter systems that carry even the heaviest rainfall safely away from your home. 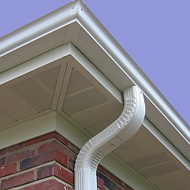 A properly functioning gutter and downspout system is essential to prevent water from entering your home and causing annoying leaks and serious structural damage. 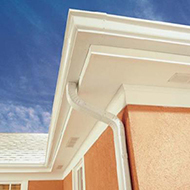 We install seamless aluminum gutters due to their durability, value and reliability. 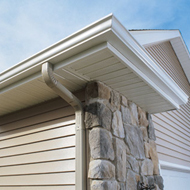 Gutters and downspouts are sized properly to accommodate the expected volume of water without filling up and overflowing, all while looking proportional to your home. We also have a variety of systems we can install to detour the water away from your foundation. 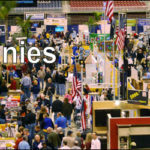 To learn more about our seamless gutter systems, give Energy View a call today!